Facebook Fan Celebration – Four Winners! We have some amazing friends at The Mommy Bunch, and one of those friends just reached a milestone. Tara, from Semmes Savers, just hit 11,000 Facebook fans! Stop on over, give her a like, and enter to win a fabulous prize! 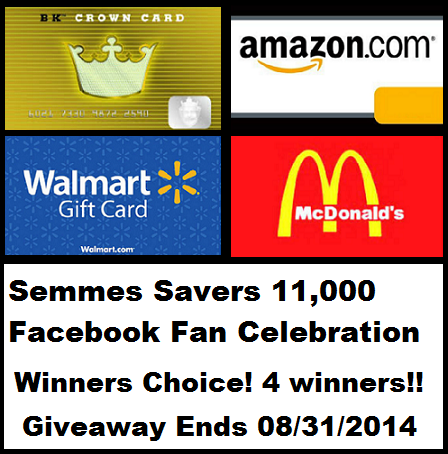 Welcome to the Semmes Savers Facebook Fan Appreciation Giveaway! In celebration of hitting 11,000 fans on Facebook Semmes Savers is hosting a “Winner’s Choice” Giveaway which will have FOUR winners! What is a Winner’s Choice Giveaway? A winner’s choice giveaway means that the winner selects the prize they receive! We will have a first, second, third, and fourth prize winner. First prize winner receives a $20 Gift Card of their choice (from available retailers). Second Prize receives a $15 Gift Card of their choice (from available retailers). Third prize gets a $10 Gift Card of their choice (from available retailers). Fourth prize gets a $5 Gift Card of their choice (from available retailers). You have a lot of options available if you win. You could select Amazon, Walmart, McDonald’s, Burger King, Winn Dixie, CashSaver, Pizza Hut, Dominoes, Paypal, CVS, Walgreens, RiteAid, AutoZone or several other options. Basically, if it’s near me, or I can order online easily, you could win it! Easy enough, right? What could be a better giveaway than one where YOU choose what you receive if you win?? Thank you for being a fan and Good Luck! !